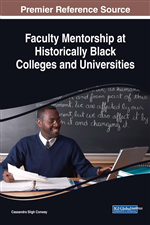 The focus of this chapter is to provide essential information on research related to the importance of mentoring faculty at Historically Black Colleges and Universities. This chapter seeks to provide the following: 1) background review of the mentoring literature in general; 2) discuss what works and does not work in mentoring; 3) provide solutions and recommendations that can be useful to faculty and administrators in conducting a mentoring environment. The conclusion of the chapter includes strategies deemed effective and critical in quality mentoring in preparing faculty, especially at HBCUs. Mentoring is crucial especially at HBCUs because of their unique challenges. Why mentor faculty at Historically Black Colleges and Universities. What does it take to give quality mentoring? These are important questions to ask in general and on the HBCU level. Mentoring at HBCUs has not always had significance in higher education. The culture of higher education tends to be guided the saying, “it can get lonely at the top.” With being in a lonely and competitive culture on the university level, one may need mentoring to understand the political and sometimes unwritten culture. When a faculty member is hired the orientation on the job tends to only include human resource personnel issues and nothing to do with mentoring. The assumption is that you are hired based on the expectation that you are an experienced person who has expertise to handle the position hired for and the ability to adjust and follow through on any level of requests. However, one may ask, “Is this the manner in which the university should view the new hire?” Navigating through such an environment presents a challenge whereby you are expected to develop collegiality. However, the interaction in practice does not support such expectation because interaction among faculty is usually individualistic and a lonely experience if one does not create the desired climate. Mentoring can support moving forward in such a climate as mentoring exposes the faculty member to a greater professional identity, career development, leadership and management development, and education support” (Best Practices: Mentoring, p. 3). •Workload: Faculty, on average, teach four or more courses a semester. Because the majority of HBCU students are first-generation college students from low-income families and are often underprepared, faculty members spend additional time outside the classroom mentoring students. Salaries: Full professors at HBCUs earn a little more than half of what their counterparts earn at the national level. Salary disparities between HBCUs and the national average range between $18,000 and $53,000 (Chronicle of Higher Education, 2011).